Square’s contactless and chip reader accepts both EMV® (a technology developed and managed by American Express, Discover, JCB, Mastercard, UnionPay, and Visa) and NFC transactions like Apple Pay (more on that below). Read more about chip cards in our post Everything You Need to Know About the Switch to Chip Cards. Order the Square contactless and chip reader. This new payment method uses near field communication (NFC) to transmit information from a mobile device to a payments reader. NFC is a type of radio frequency identification technology that allows your smartphone and a payments device to talk to each other wirelessly and complete the appropriately named contactless payment. NFC transactions are just as secure as EMV, but they’re a lot faster. If you’ve paid with your chip card, you’ve probably noticed that the whole process takes quite a while. NFC mobile payments, on the other hand, take just seconds. And they’re a lot more convenient — customers don’t need to carry around a physical wallet, just their smartphone. As a business owner, you can start accepting mobile payments by purchasing an affordable NFC reader like the Square contactless and chip reader. You can read more about mobile wallets in our post What Is a Contactless Payment? Apple Pay is currently available on newer versions of the iPhone, as well as the Apple Watch. When customers pay with this method, they use a credit or debit card saved to Wallet and hover their iPhone or Apple Watch over a payment reader while holding their finger on the Touch ID button to have their print scanned and verified. The transaction takes only a few seconds to complete. 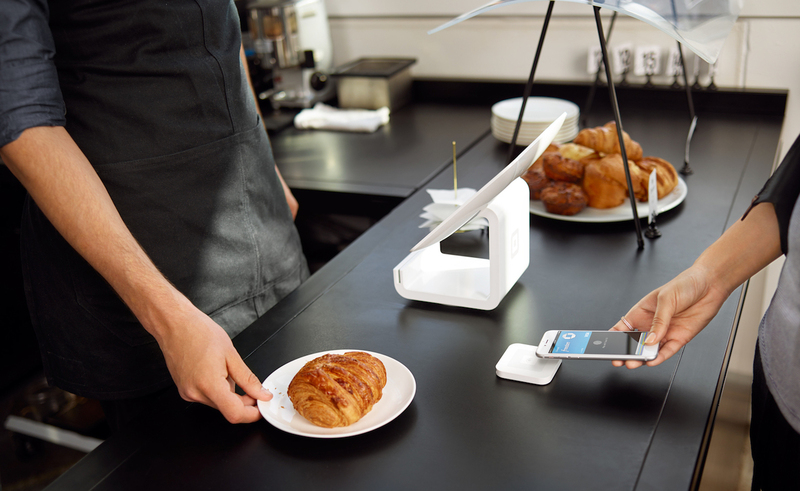 Read more about how to use Apple Pay — and accept it at your business. Google’s mobile wallet technology, Android Pay, is available on all NFC-enabled devices that run Android version 4.4 or later. To use Android Pay, customers just open the app on their phone (which requires the user to have a secure lock screen) and complete the transaction by holding their device over the payment reader. To use Samsung Pay, customers open the app and then hold their device over the point-of-sale terminal. This technology is available on the Samsung Galaxy S6, Galaxy S6 Edge, Galaxy S6 Edge Plus, and Galaxy Note 5. If you have clients, one of the struggles can be actually getting paid, an endeavor made more frustrating when relying on paperwork, checks, or taking credit card numbers over the phone. Digital invoices streamline this process. For example, with Square Invoices, you can send invoices from the app on your mobile device and track them on your Dashboard. And when you free up the time that you used to spend hunting down payments, you can focus on more interesting New Year’s goals, like resolving to take a vacation. This year will mark some big shifts in the way we pay for things. To ensure you can securely accept any sale this year, it’s a good idea to fast-track the latest and greatest POS and payments processing technologies at your business. Want to try digital invoices? Click to get started today. Square has a variety of online andin-person paymentmethods that can help you grow and streamline your business. Here are eight ways you can integrate online payments into your business. Sending out paper invoices is cumbersome, time consuming, and not so friendly to the environment. A far more streamlined, convenient, and ecofriendly way to go is online invoicing. With software like Square Invoices, you can use ready-made invoicing templates to quickly and easily spin up invoices and send them out to your customers, where they can pay with a click right from the email. That means that you get your money a whole lot faster than with the snail-mail approach. Paid invoices usually land in your bank account within one to two days. Square Invoices also has the added benefit of allowing you to track all your invoices, so you can quickly see what’s been paid and what’s outstanding. A quick and easy way to get paid online is with Square Cash. The mobile app lets you request payments for business goods and services at just 3 percent per transaction. Because it’s all through an app, it’s easy for your customers to pay you on the spot, and the money is available to you within seconds. You can also set up an online cash.me profile, which you can share for instant payments. If you’re a business that deals with appointments, it’s a good idea to consider adopting an online payment method that lets your customers prepay you for the service. 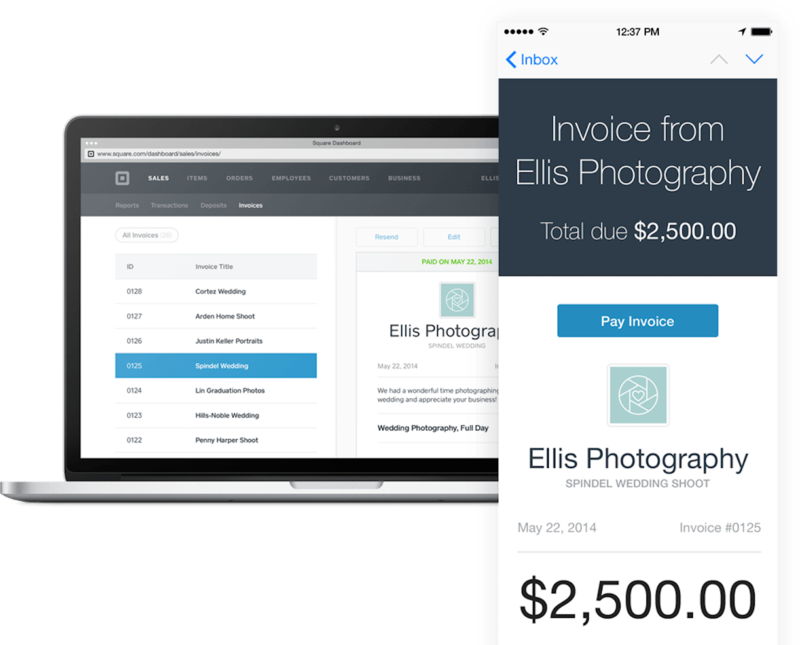 This is easy to do with Square Appointments, which has a client prepayments feature baked right into the software. Client prepayments also have the added benefit of helping to cut down on no-shows (if people prepay for a service, more likely than not they’ll show up). Square App Marketplace has 21 business apps you can connect to your Square account to help you streamline and manage your business. You can set up a beautiful online store to complement your brick-and-mortar store using e-commerce apps like BigCommerce and Weebly. In addition to being a way to accept online payments, these apps can help you with tasks like streamlining inventory management across all your selling channels. With Square’s E-Commerce API, you can use Square to process online payments on your own self-hosted, fully developed website. By seamlessly integrating your website with Square, you can grow both your online and offline businesses together in one dashboard. Square’s E-Commerce API also makes PCI compliance easy. Because customer credit card information never touches your website, you don’t need to complete a single PCI DSS checklist to make sure you’re PCI compliant. With Square’s E-Commerce API, you can use Square to process online payments on your own self-hosted, fully developed website. By seamlessly integrating your website with Square, you can grow both your online and offline businesses together in one dashboard. Square’s E-Commerce API also makes PCI compliance easy. Because customer credit card information never touches your website, you don’t need to worry or complete a single PCI DSS checklist to make sure you’re PCI compliant. Square’s hosted checkout solution, Square Checkout, allows merchants to accept online payments for supported payment types using a checkout workflow form hosted at squareup.com. The checkout form provides next-business-day deposits, a PCI-compliant integration, and SSL support. Left your Square Reader at home? Not to worry, you can manually enter your customer’s credit card information into your Square Point of Sale app for a card-not-present (CNP) transaction. For manually entered transactions, Square’s fee is 3.5% + 15¢ per transaction. To use Square Square Point of Sale’s manual entry feature, you need your customer’s complete card number, expiration date, security code/CVV, and billing ZIP code. Read more about using manual entgry. Remember: Manual entry is best for businesses that only occasionally bill remotely. If you regularly bill customers from afar, consider trying Square Invoices (option 1) instead for a flat fee of 2.75% per transaction. There are no extra fees, and you only pay for the invoices that are paid online. Using Square Point of Sale, you can accept credit and debit cards, Apple Pay, and Android Pay at a rate of 2.75% per swipe, tap, or dip. Once you’ve set up your Square Stand with your iPad, or connected your chip reader to your Android or Apple device, you can swipe magstripe cards through the track in the front of the stand, and dip chip cards or tap an Apple Pay or Android Pay enabled device to accept payments with the contactless and chip reader. Remote payments are ideal for businesses that take orders over the phone or fax to charge a client’s credit card safely and securely. Because card-not-present (CNP) transactions naturally carry a higher amount of risk, payment processing fees tend to be higher to accommodate a higher occurrence of chargebacks or fraud. Turn your computer into a cloud POS with Virtual Terminal at a rate of 3.5% + 15¢ per transaction. No hardware, reader, or app installation is required. To process a transaction, you need your customer’s card number, expiration date, CVV/CVV2, and billing ZIP Code. Virtual Terminal is ideal for if you want to immediately charge a customer remotely for orders received over the phone or online. If a customer’s card on file is expired or lost, how can I update their preferred payment method? You can update a customer’s preferred payment method by going to your customer’s profile in your Customer Directory, and selecting Edit Personal Information. Your customers can also remove their own cards by following the link provided to them on all Card on File notifications. Customers receive notifications when their card is stored, when their email address is changed, and when a payment is made using a card on file. Why does your list of payment methods include different processing rates and fees? When a transaction is completed and a card is not present (CNP), Square assumes a higher risk of fraud and chargebacks. Therefore, CNP payment methods have a higher processing fee than transactions completed in person through Square Point of Sale. Authenticated, in-person payments like chip cards and NFC tend to be the most secure way to get customers to pay, and generally have lower processing rates associated with them. What is the most secure method of payment? In-person payments with the card owner’s signature are highly secure, reducing the risk of chargebacks and credit card fraud. You can also require a valid government-issued ID with every credit card purchase, and keep proof of all credit card orders. If you take payments where the card is not present, you might ask your customers to sign a credit card authorization form, which gives you permission to charge their card on an ongoing basis. NFC mobile payments like Apple Pay are dynamically encrypted, making them one of the most secure ways to pay with a credit card. The near field communication (NFC) creates a contactless transaction that utilizes tokenization to keep your data safe. Read more on NFC payments here. EMV chip cards are much more secure than traditional magnetic-stripe cards, and have encryption built right into the chip. The UK has seen a nearly 70 percent decline in counterfeit card transactions since adopting EMV chip cards, according to Barclays. You can learn more about the liability shift with our guide. I want to build an online shop, which payment method is right for me? To build an online shop, you have a few options. If you host your own fully developed website, Square’s E-Commerce API allows you to create the best payment solution for your site, on Square’s payments processing platform. If you have your own site but don’t want to build a payment page, Square Checkout provides a payment workflow in conjunction with squareup.com that includes security features. Square also syncs with a variety of beautiful, no-coding-required e-commerce platforms like BigCommerce, Wix, and Ecwid that help you start your online store quickly. Find the best solution for your needs in Square App Marketplace. Not interested in managing your inventory online? No worries! With Square Virtual Terminal you don’t need a separate card reader or app, making it ideal for businesses that specialize in wholesale orders or bill remotely over phone or fax. What Is a Mobile Payment?